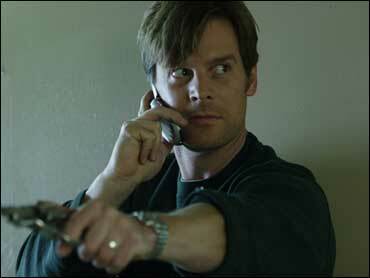 Peter Krause, former star of HBO's "Six Feet Under," returns in "Civic Duty," a low budget psychological thriller directed by Jeff Renfroe ("One Point O") which recently made its debut at the Tribeca Film Festival. He plays a man who suffers disastrous consequences when he gets irrationally wrapped up in his own post 9/11 paranoia. A modern take on Hitchcock's "Rear Window," "Civic Duty" traces the downward spiral of Terry Allen, a downtrodden accountant who abruptly loses his job. In between sending out resumes and going on job interviews, Terry (Krause) finds that he's got a lot of time on his hands. He whiles it away watching CNN updates of the latest terrorism news. Soon the information he gets from the newscasts twists his sensibility and he begins to nosily peer out his window at his new neighbor, an Islamic man who just moved into the apartment complex. He grows suspicious of neighbor Gabe Hassan (played by actor Khaled Abol Naga, who is a star in his native Egypt) and his minimalist lifestyle. He goes to great lengths to expose something — anything — unsavory about him, searching through his trash, following him to his job, and calling on the FBI for help. Though he has no real reason to doubt Hassan, he's convinced that he's up to no good. Terry's relentless obsession with exposing wrongdoing overwhelms him and pervades all aspects of his life. Krause delivers a chilling performance as a man who will stop at nothing to expose what he believes is a well-planned terrorist plot. Terry's wife, Marla, played by "Invasion" star Kari Matchett, is appalled by her husband's behavior and irrational suspicions. She quickly sees him change from law-abiding citizen to raging vigilante. "West Wing" star Richard Schiff also appears as an FBI agent who Terry confides in.